Reducing cost is a fundamental motivator for any savvy business owner, but a recent report at Business.com might be the tipping point for those still on the fence about migrating their small business to the cloud. Business.com reported in 2017 on the results of a study by software company Exact in collaboration with PB7 Research. Beyond savings in IT cost, the study showed surprising results for companies that adopted the cloud. Not only did they double profit margins but these companies increased revenue growth by 25%. Bear in mind that these represent the overall average results. Many companies reaped an even larger return on investment after moving to the cloud. So how did the cloud work its magic to achieve these incredible numbers? The days of one computer-one server are far behind for businesses who have adopted versatile cloud technology. Employees can access information and software anytime and anywhere, using their favorite devices. Adding mobility so employees can achieve productive results in or out of the office has a significant positive effect on the bottom line. In any successful business growth happens. The cloud allows a business to expand application resources and data storage capabilities without the need for heavy investment in on-premise hardware and the human resources needed to keep them online. Conversely, in the case of a downturn in the economic cycle, a business does not find itself covering the cost of idle resources. Scalability in the cloud allows the increase (or reduction) of the virtual machine capacity created to handle business applications. When required, a "scale-up" ( scaling vertically) can be achieved by increasing the size of the virtual machine. Another option would be to "scale out" (scaling horizontally) where additional virtual machines are created to divide the increased load between them. This versatility gave rise to the term "computing on demand". The cloud's virtual machine concept opened the doors to super-computing for machine learning and artificial intelligence development by independent tech companies who could not otherwise access the massive computer resources required for these endeavors. Skepticism concerning security on the cloud may have deterred some small businesses from making the move in the past, but cloud providers have long since responded to the issue. "Secure Cloud is no Longer an Oxymoron" is the title of a 2017 Business.com article. The article points out that these days security does not need to be a primary concern as long as executives put effort into choosing the appropriate architecture and security options, as well as vetting potential vendors. Cloud platforms and plug-in services can allow small businesses to reach markets once accessible to only major corporations, according to the Intuit study. The study cites as an example AirBnB which provides a community infrastructure that allows individuals to access a mass market. With significant IT savings, doubled profits, increased revenue, enhanced security, and expanding strategic opportunities for small businesses, the question small business executives are asking now is "How soon can we move to the cloud?" 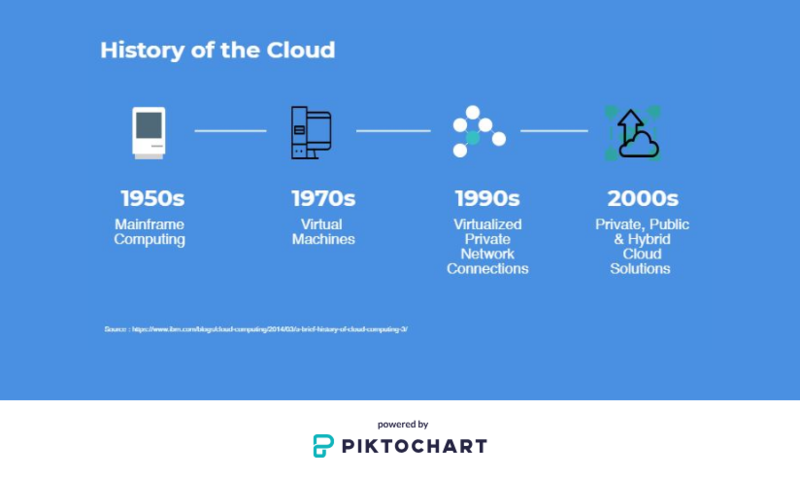 The term "cloud" is a holdover from the pioneering days of the Internet when the expansive network was notated on flowcharts simply as "the cloud." Since the cloud computing concept has reached maturity in recent decades, accelerated in usability by advances in broadband connection speeds, there is a misperception that the cloud is a recent 21st-century invention, as reported in this article at IBM. Cloud concepts have been evolving gradually since the 1950s, starting with the development of mainframe computing. The first "dumb terminals" allowed access for multiple users to a mainframe computer, when computer sizes and cost were enormous. Since the full processing power of the mainframe was not needed by the typical individual user, this "shared access" concept made the best sense economically for businesses at the time. Today's Chromebooks use the same idea, relying entirely on internet access to run applications and retrieve data. The next step up was the development of VMware or Virtual Machines somewhere around 1970. This concept made it possible to execute one or more operating systems in a single hardware environment simultaneously. Virtual machines became analogous to complete computers within a computer. We still rely on the VM concept in cloud computing today. It provides the versatility to scale up (or down) to meet business application and data demands, giving rise to the cloud computing term "computing on demand." Cloud computing can best be explained as the transfer of data storage and applications from on-premise hard drives and servers to the internet. To name just a few popular services, if you are using Facebook, Hotmail, Gmail, Microsoft One-Drive, Google Docs, or Google Drive you are already enjoying the benefits of the cloud. These services give you the ability to access apps and data from any of your favorite devices without depending on any single hard drive. Mobility and increased access to data are significant factors driving businesses in the massive move to the cloud today. In the recent past, cloud computing was hindered by slow dial-up connection speeds. Today broadband speeds rival those of processing speeds in a hard drive, enabling compatible app performance in the cloud. In many cases, enterprise-class applications with high levels of transactions show significant performance improvement after migrating to the cloud. The cloud, despite its ethereal connotations, is rooted firmly to the ground in a massive network of data centers and technical service providers all connected by miles of cable according to this article at Forbes. Microsoft and Facebook have teamed up to lay a 4,000-mile underwater cable to speed up connections between massive data centers in Virginia and Spain. Once across the Atlantic Ocean, they will branch out to points in Africa, Asia, and the Middle East. High standards for speedy processing in the cloud have ruled out satellite technology as an option because of delays, and the undersea cable can deliver data at 160 terabits per second. For Microsoft, this super-fast data connection will extend the reach of Azure, Bing, Xbox, and Office. For an individual user, migrating his music and pictures to the cloud may not be a significant decision, especially if he is prone to misplace his flash drives or has already replaced his laptop with a Chromebook. For businesses though, migrating to the cloud has no "one size fits all" solution. A business still using older legacy applications might face performance obstacles, and network architecture is always a consideration which must be evaluated before any migration of business apps or data to the cloud. 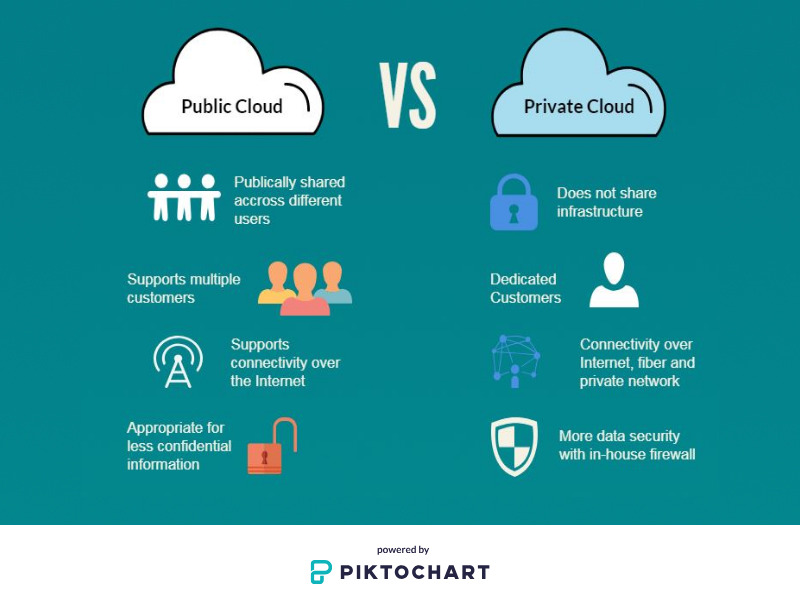 Many organizations outside of the tech industry have heard of the terms private cloud computing and/or public cloud computing, but are not necessarily familiar with the differences between the two concepts, or perhaps even what cloud computing actually is and how it differs from an intranet. Cloud computing services allow organizations to deliver the software applications and data they use over the internet. By delivering over the internet, it allows companies greater flexibility to access what they need, wherever and whenever is convenient, without requiring an intranet portal. As long as staff members have an internet connection and proper credentials, they can access their organization's cloud. A private cloud or internal hosting solution, as it is sometimes referred to, is a cloud solution that is located on a company's current intranet or data center. Some of the benefits of this include potentially making use of current IT infrastructure, no sharing of resources with other organizations, and potentially more data security, as all data can be protected behind an in-house firewall. With all these benefits, one might question why an organization would want any other kind of cloud solution. However, there are downsides to hosting one's own internal cloud. The constant managing, maintenance and updating of private cloud solutions requires an extensive investment in an IT team that can perform all the tasks associated with maintaining a cloud solution. In addition, companies who have their own cloud must continually maintain and upgrade their cloud software and hardware components, in order to continually meet the technological demands of the company, while also ensuring the highest level of data security. With a public cloud solution, organizations are free from the continual need to staff their own extensive IT department in order to properly maintain an internal cloud. An organization who uses a public cloud relies on their cloud provider to invest in all the hardware and software necessary to maintain cloud services. If the organization wants to test and/or deploy new software products, they can simply ask their cloud provider for increased services. Many cloud providers allow their clients to temporarily increase or decrease their cloud services as their needs change, so clients always have options with regard to flexibility. In addition, even on a public cloud all client data is housed separately from the data of other organizations and with a reputable and professional cloud provider, there is no more likelihood of a data breach than there is with a private cloud. There is no single answer to the question of which one is the best solution. Some organizations are required to maintain their own private cloud due to government or industry regulation constraints. For those organizations who have no special security limitations, they need to seriously consider whether they want to invest in not just the upfront costs, but the continual costs associated with maintaining their own private cloud. Public cloud solutions allow smaller organizations to have access to state-of-the-art cloud technology services without requiring them to make a significant financial investment. Public cloud services also provide great flexibility. If a company needs more cloud services for special, time-limited projects, they can ask for increased services from their cloud provider. If they want to scale back, even temporarily, that is easily arranged as well. Smaller companies will also likely appreciate the fact they will not have to spend significant amounts of time and resources to maintain their own cloud. Instead, they are free to focus on doing what they do best, which is to provide excellent products and/or services to their own customer base. Cloud technology has swept the IT world over the past decade. A recent study by Intuit and Emergent Research predicts that over 80% of small businesses will have moved to the cloud by 2020. An searchcloudcomputing.com points out that "migrating to the cloud is often touted as a no-brainer." However, looking beyond all the current cloud hype, not all workloads can benefit from the move. The decision to migrate from on-premise servers to the cloud is far from a "no-brainer" as we shall see. For businesses considering the move, the benefits of IaaS (Infrastructure as a Service) and SaaS (Software as a Service) provided by the cloud could make it quite tempting to use the "rip and replace" method to move all on-premise server applications immediately to the cloud. For startups the decision to move to the cloud is easy. They can be up and running with enterprise-class capabilities they would not have been able to afford otherwise. However, established businesses in the enterprise-class already have a substantial investment in on-premise hardware. To those companies, a thoughtful cloud migration strategy is needed to determine which, if any, of their existing applications, are cost-effective candidates for the move to the cloud. Despite the cloud's reputation for "computing on demand" versatility, when considering migration of workloads, there is no "one size fits all" solution. There are technical and financial conditions to be considered by each business before deciding to move from on-premise servers to the cloud. Are currently workloads being handled by the servers? How substantial is the company's current investment in infrastructure? Are current applications cloud compatible? Let's take a look at some of the factors that can help businesses determine if they are a good fit for a move to the cloud. Even the best server hardware eventually becomes obsolete, and many organizations have developed life-cycle policies to retire servers after a set period. If existing servers are nearing that retirement date, a company may find itself at the most opportune time to move to the cloud. Rather than moving to new hardware, the IT team can begin the orderly migration to the cloud. For companies with large on-premise data centers, abandoning that investment and outsourcing to the cloud can be a daunting decision. They will need to factor in the ongoing costs of maintaining on-premise hardware such as licensing, resource consumption, software upgrades, and support. Companies which have grown beyond current data handling capacity could consider the versatile scalability of the cloud as an enhancement to the existing infrastructure; it is important to remember that migration to the cloud is more than an "all or nothing" option. While the total "rip and replace" move might not make financial sense for companies with a large investment in on-premise data centers, outsourcing certain server-side resources to the cloud could still be beneficial. This is especially true when existing hardware can be repurposed to use resources freed up by the cloud in a productive way. Not every application will perform well in the cloud which is a factor which needs to be evaluated before migration. In an article at APM digest, app industry expert Russell Rothstein points out that applications require the right architecture to function correctly in the cloud. Russell cites as examples where performance is likely to degrade in the cloud, those applications with "too much chattiness" or back and forth communication, and complex applications with large numbers of tier dependencies. Conversely, applications with high levels of transactions or resource volatility are likely to show an immediate improvement in performance. In the APM article Steve Harriman, Senior Vice President of Marketing at ScienceLogic, advises that data center applications should be cataloged, with service profiles developed for each one. Determining those applications with dependencies on the horizontal scale or high resiliency can distinguish the best candidates for migration to the cloud. The advantages of profitability and scalability made available to businesses by the Cloud have been the driving factors in the move from on-premise data centers to storage on the Internet via the cloud. As cloud computing swept the IT world over the past decade, some businesses are still nervous about placing sensitive customer information and tightly secured business applications somewhere other than their own data centers. Cloud providers quickly realized that enhanced security had to be foremost in their services to remove the one major tripping point for enterprises contemplating the move to the cloud. Strong security was mandatory to win the trust required to serve as an organization's online vault for sensitive data. Without that trust, a cloud provider cannot stay in business for long. By 2013, leading cloud service providers could provide security measures that go well beyond what many businesses could afford to implement on their own, as reported in this article by Cloud Expo Journal. Now in 2018, there are three primary methods for encrypting data to ensure security in the cloud. As reported in the January 11, 2018, article at cloudsecurityalliance.org organizations are implementing CASB (Cloud Access Security Broker) to secure critical corporate data stored in cloud apps. With this technology, all data flowing out from the organization is encrypted using any of three generic cloud-based methods. Gateway Delivered Encryption- With this method, the vendor cannot access your data, and you control the keys. Key management can be integrated with an organization's existing Key Management Interoperability Protocol (KMIP). Even if a cloud-based key management solution is used the keys never leave your CASB. BYOK Encryption- As the anagram suggests this is the Bring Your Own Key encryption method. Keys are generated and managed within your organization, then shared with the vendor. This allows control of the lifecycle as well as the ability to rotate or revoke keys. Once shared with the vendor, data can be decrypted only by authorized users. Data is encrypted at the vendor who also retains access to the data, but you control the keys. Vendor Provided Encryption- Data is encrypted at the vendor who also controls the keys and retains access to data. Leading cloud providers such as AWS (Amazon Web Services), Microsoft Azure, and Salesforce are moving to support the BYOK model. While gateway delivered encryption provides the highest level of security for critical apps and data, it comes at the price of usability issues, especially when the vendor changes field structures. BYOK strikes a balance by providing a high level of security and usability for high-risk apps and data. Vendor provided encryption provides better security than no encryption at all and may be suitable for meeting compliance in non-critical apps or data. "Insider threats continue to pose the most significant threat to organizations everywhere." according to this 2016 report by IBM security. In 2015, 60% of all attacks were caused by insiders, whether they had malicious intent or were inadvertent actors. Inadvertent actors are those well-intentioned employees who mistakenly grant access to data or fail to uphold the company's security policies. The best security available can still be compromised by an employee who "hands over the keys" after being duped by a phishing scam or opens the gate for malware in an email attachment. IBM reported that the numbers are improving, as organizations implement better security policies and employee awareness. Any business tool which can reduce costs while increasing productivity to drive profit margins higher is sure to catch the eye of discerning small business owners. The Cloud has proven itself to be that tool, providing versatility for data storage and access to business information anytime, anywhere, all at a reasonable price. New to Cloud Computing? Maybe Not! Business owners exploring the benefits of cloud computing should be aware that they and most of their employees are most likely using cloud applications already. Gmail, Outlook, and Facebook are all cloud-based services. Google Drive, Google Docs, Apple iCloud, and Dropbox are all file-sharing applications on the cloud. Microsoft offers mobile versions of Office which provide a familiar interface for phones and tablets, as well as OneDrive cloud storage. Popular conferencing applications such as Skype, Facetime, and GoToMeeting allow worldwide consultation via the cloud. Entertainment services such as Netflix and Hulu have been using cloud technology to stream movies and TV shows with cloud technology for years. Now let's take a closer look at how cloud technology can improve your bottom line. When a business moves to the cloud the provider's servers are used for file storage, software programs, and data backup. This removes the need for an IT team onsite to install and manage email servers, run backups, and install and upgrade software. With cloud computing, the IT burden is outsourced to the cloud provider. This frees up valuable knowledge personnel for higher level development and allows existing onsite hardware resources to be repurposed or even eliminated. Another advantage motivating business moves to the cloud is storage versatility. A startup or rapidly growing company doesn't need to increase onsite hardware to keep up with expanding demands. Conversely, in an off-peak business cycle, the need to pay for unnecessary capacity and service applications is phased out. A 2017 report at Business.com on the results of a study by the software company Exact in collaboration with PB7 Research showed outstanding numbers for companies that adopted the cloud. Not only did they double profit margins but these companies increased revenue growth by 25%. The combination of reduced hardware and security expenses with increased productivity enabled by unlimited access to data and business applications are the contributing factors to these incredible statistics. Maintaining onsite email servers can be frustrating and costly. With an ongoing need for storage scalability and software upgrades, many companies are migrating email hosting to the cloud as a highly cost-effective solution. A report at thoughtreach.com citing a 2009 study by Rich Cannon indicates that " the average business email user would spend more than 20 times less on email by outsourcing their hosting compared to hosting it themselves." Hosted exchange providers have the expertise to keep servers operating 99.9% of the time, and most reputable hosts hold ISO27001 information security certifications. Many businesses are deterred from cloud hosting because applications are integrated in a way requiring them to operate on their own physical servers. The idea of shared servers is unappealing. Hosted infrastructure can allow organizations in this situation to take advantage of the benefits of the cloud. Hosted infrastructure is analogous to moving your servers to a rack in a data center, requiring only a significant internet connection on site. Outsourced infrastructure services are now available for a predictable recurring fee. For many organizations, hosted infrastructure is the first step in cloud migration.